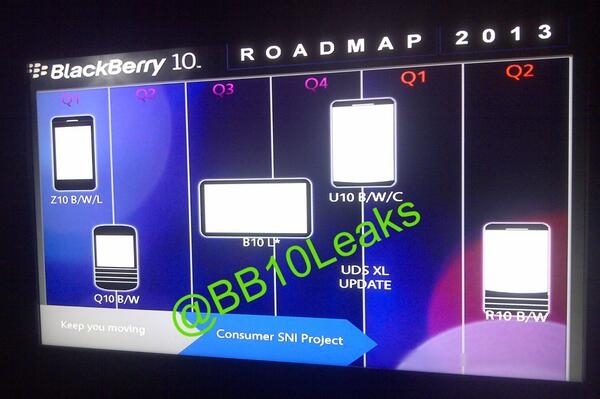 Leaked BlackBerry road map shows BB10 tablet and phablets on the way | BlackBerry Blast! A leaked BlackBerry road map appears to show BlackBerry will offer a tablet and two phablets later this year. The road map was leaked on a Twitter account @BB10Leaks, so chalk it up as a rumor. All three devices will run BlackBerry 10 and will be out in the second half of this year. BlackBerry has had no comment on the leak, but CEO Thorsten Heins has previous said BlackBerry would release several BB10 devices this year.